Pink Floyd famously sang “Money. It’s a blast.” While there was a bit of sarcasm in their song, nothing could be more accurate today in continuing medical education (CME). My friends and colleagues across the CME community are being required to develop new revenue streams to support their CE education programming and operations. When I first entered the CME world back in 2000, it was mostly unheard of to charge for continuing education in the health professions. Then, starting with the 2008 Recession and growing opposition to widespread commercial pharmaceutical support, all that changed. Think Like An Entrepreneur – I recently attended a session at the 2016 ASAE Annual Conference that focused on helping association executives develop “new revenue veins.” At the core of their discussion, the presenters spoke passionately about the need for associations to change their mindset: Stop thinking about as your association as “Just a not-for profit” and start thinking about it “As a business with not-for-profit tax status.” This doesn’t mean that you have to adopt cut throat corporate business tactics like you see on Wall Street. As our friend and former Director of Continuing Medical Education at Duke Clinical Research Institute, Dr. Chitra Subramaniam, says “You need to adopt strategies that support ‘Entrepreneurial CME’.” Chitra developed new revenue streams through external partnerships, subscription models for CME content, and streamlining internal operations and processes. We are very pleased that EthosCE LMS has been key to this successful process. You can learn more about Chitra’s success in our webinar. Conduct a Competitive Analysis – As part of being an “Entrepreneur in CME,” you need to survey the competitive landscape. Breakout a spreadsheet and research what other comparable associations, academic centers, and health systems are doing to market and sell their continuing education products to the healthcare community. Set up columns and document prices they are charging for different educational formats, methods of payment, rate their website branding and ease-of-use, what tools, such as a Learning Management System, are they using, etc. Then, drill down the list to no more than 10 organizations (and be sure to include your organization in the mix). This process will enable you to get a broader vantage point of your strengths and weaknesses vs. your “competition” and then formulate a strategic plan for cultivating new revenue streams. Monetize Your Educational Content – For years, I have worked with very talented CE providers who spend a significant amount of time and resources to create “one off” activities (e.g., live conference or webinar that is conducted once and are never seen again). CE providers are missing huge opportunities to monetize and create new revenue streams by recording and re-packaging a CE activity into a enduring program and making them available online for purchase. EthosCE Learning Management System, for example, has three popular features for growing new revenue streams: Course Cloning, Integration with GotoMeeting, and Subscription-Based eCommerce. Organizations using EthosCE can easily sell and host a live GotoMeeting webinar. Upon conclusion of the live webinar and the learners obtain their credit, you can hit “Course Clone” within EthosCE and generate a new CME activity complete with assessments, evaluations, credit types and certificates. You then just upload the recorded, accredited version of the GotoMeeting webinar and now you have a new CME activity that you can charge money for. To top it off, you can use EthosCE’s subscription module and enable learners to purchase a series of CME activities at one time. You get a long-term revenue stream and you stay engaged with your target audience. Modernize and Streamline Your Operations – You cannot develop an entrepreneurial CME enterprise without a modern, strong foundation. Everything from application intakes, ACCME PARS Reporting, Conflict of Interest (COI), faculty management, etc, must be examined, refined to “get out the dead wood”, and automated. At EthosCE, we use software and Lean Six Sigma to refine process and increase efficiencies across every aspect of CE management. For example, “How many clicks does it take for a person to register?” or “Why are your learners calling your office when they can use their mobile device or smartphone?” One of our clients recognized a 47% decrease in calls to their office just by using EthosCE’s Transcript Manager. That represents a lot of saved hours and new time to focus on increased education productivity. Bob Dylan once sang “The Times They Are A Changin’.” I feel that theme everyday in CME and I hope that this “short-list” begins a broader conversation within our community. We plan to expand upon this discussion in future posts. Hi! Interesting, to-the-point post. In my experience with medical practitioners it was proven that it’s a real test for a LMS – if it can really be useful. Therefore, as I see you’ve got substantial experience – what strategies would you recommend when it comes to designing courses and adjusting LMS to the needs of such a specific audience like medicine practitioners. Are there any tricks on how to do that? Do you collect feedback in a systematic way? 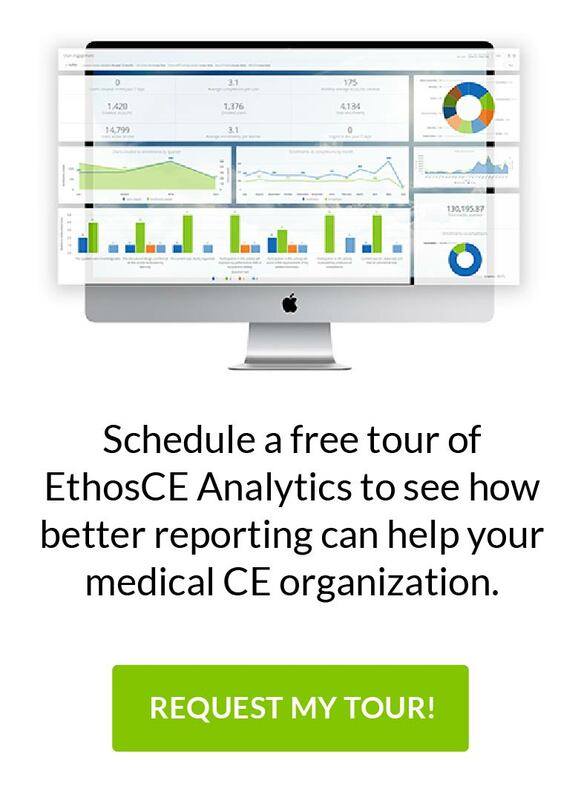 EthosCE: Mobile Text Messaging App for Tracking Live Meeting Attendance to be Presented at the Alliance for CME EthosCE Version 3.2 Released!